"Our crash crew was in front of the flight line fire station waiting for our relief to replace us for the next shift. 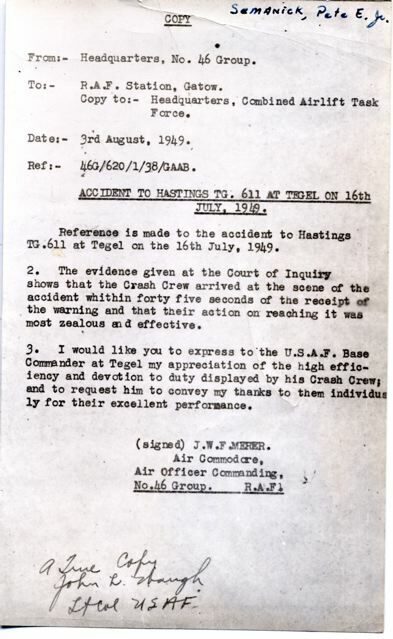 (24 hours on duty - 24 hours off duty) Several Hastings had been grounded overnight at Tegel due to bad weather. We were able to overhear all radio transmissions with tower and aircraft crews. The aircraft started their engines and asked for taxi approval. Approval was given and aircraft started their way to the end of the runway. The first aircraft asked for permission for take-off and tower granted this request. As the aircraft went rolling down the runway and immediately became airborne, all engines quit firing and the aircraft nosed over and crashed right across the ramp from our fire station. Our fire crews were already in our trucks and responded as soon as we saw what had occurred. You can see from the pictures that not much fire damage occurred due to our quick efforts of fighting the fire. I was on the first truck at the scene and my partner and I used our handlines dispensing high pressure water and foam extinguishing agent. In a second or two we observed a dead crew member in our approach path. My partner couldn't stand the sight and passed out, which left me alone to fight the fire. We were only 18 years old and this was our first crash with causalities. I am 77 years old and even though this was in 1949 I can still see the body there on the ground. The Handley Page Hastings aircraft # TG.611 was out of RAF Gatow near Bergen Germany. Crew members were F/O Ian R. Donaldson, Sergeant Joseph Toal (Glider Flight Regiment), Navigator 1 William G. Page, Signaller 11 Alexander Dunsire and Engineer 111 Roy R. Gibbs. All 5 perished."